I've always been an advocate of fine wine and also of great craft and micro brewed beers. This Easter weekend's cooking was delayed by a trying a series of three beers from Oregon's Rogue Brewery. http://www.rogue.com/index.php This Newport brewery was established in 1988 by three partners with the premise of making fine microbrewery beers that are made for "food and beer pairing" using no pasturisation, no preservatives and all natural ingredients. Being PNW Pacific Northwest based Rogue also has the benefit of using locally sourced malts and hops. Their 'Pacman" proprietary "wild yeast" gives the beers a distinct flavour and body profile. All beer were tasted from 650ml (22 US ounce) bottles. Malts: Northwest Harrington, Crystal, Triumph, Maier Munich & C-15. Hops: Styrian Golding & Amarillo. Straw gold colour with light carbonation and little lacing. Aromas of subtle flowers and malts. On the palate is its medium-bodied, smooth, some bitterness, very mild almost non-existent juniper flavours. My least favourite of the flight but have been brought up with juniper encrusted and sauced game dishes and summer G&T's the lack of a "British" palate of intense juniper gives it a slightly lower thumbs up. Still enjoyable and good beer with venison sausages, white bird meats, and trout. Malts: Two Row Pale, Cara Foam & Melanoiden. Hops: Amarillo. Yellow gold colour with good carbonation and lacing. Complex nose of citrusy hops, pine, and apple. Medium-bodied, dry, and crisp with typical IPA flavours, not too bitter, but refreshing with lemon, grapefruit, and subtle pepper flavours. Try this one with a tandoori, grilled fish and white meats, and spicy BBQ sausages. Malts: Harrington, Klages & Maier Munich. Hops: Cascade and Willamette. One of my Rogue favourites! Golden mahogany colour with malty, pepper, and subtle smokey aromas. Medium-bodied, creamy textured with nice balance of hops, malt, and chipolte. Intriguing to drink, the lovely smokey peppery notes, kick in about 5-8 seconds after swallowing. Try this one with BBQ red meats , bison burgers with blue cheese, Tex-Mex cuisine, and for a real but very tasty shocker! dark chocolate. 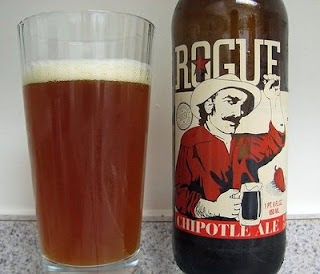 Hazelnut Brown, Double Dead Guy (bok) or Porter all the way when it comes to Rogue!